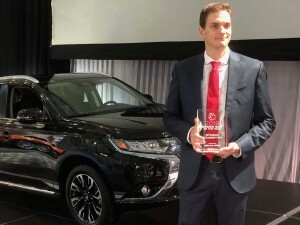 Jaguar I-Pace and Mitsubishi Outlander PHEV also honored. 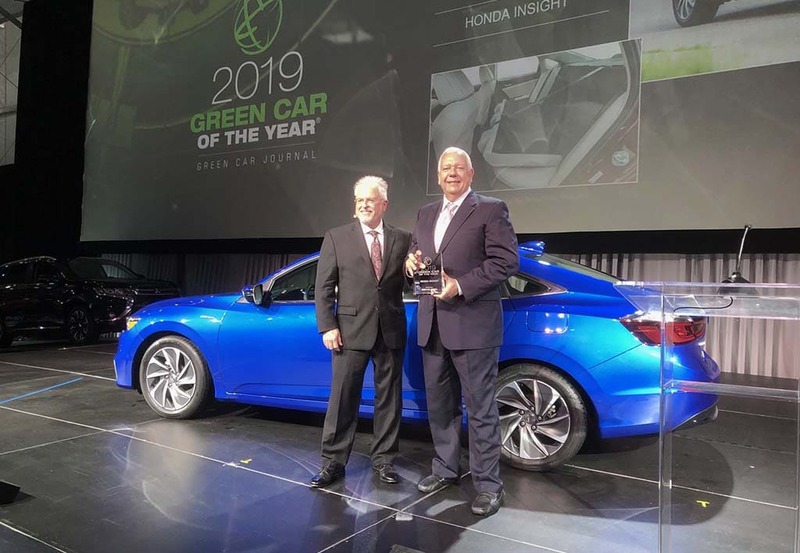 Honda's Ray Mikichuk with Green Car Publisher Ron Cogan and Green Car of the Year Insight. The 2019 Honda Insight was named the Green Car of the Year on Thursday, during a news conference at the Los Angeles Auto Show. The award comes as something of a vindication for Honda. The automaker was actually the first to sell a hybrid in the U.S. market, but the original, two-seat Insight, launched in 1999, was a slow seller and a second version bearing the Insight badge didn’t do much better. The new model finally appears to be connecting with consumers by “being a no-compromise vehicle,” Ray Mikichuk, Honda’s assistant vice president for U.S. sales, told TheDetroitBureau.com. 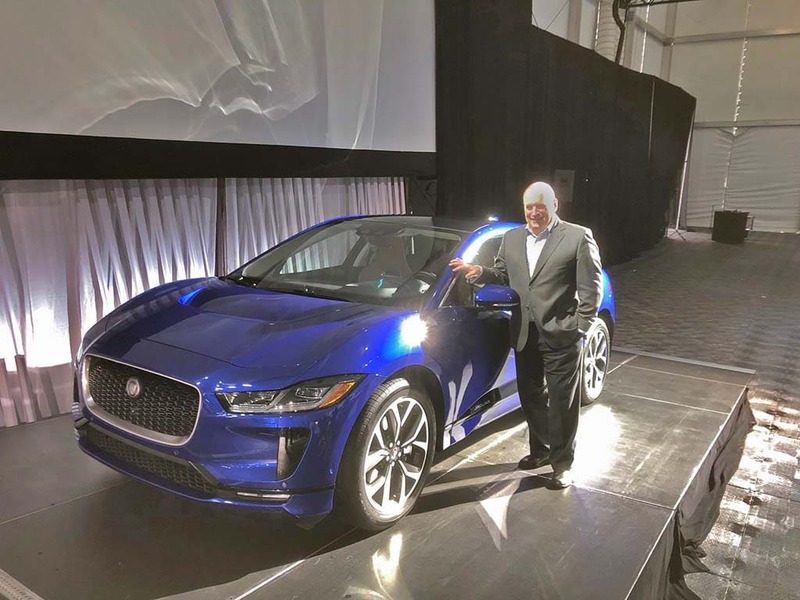 Jaguar's Joe Eberhardt with the I-Pace and the Luxury Green Car of the Year trophy. While Honda went for a relatively conventional design approach, Jaguar chose a more radical look that takes advantage of using a skateboard-like platform for the new I-Pace battery-electric vehicle. With the motors, batteries and most electronics under the load floor, I-Pace can deliver a large interior in a small footprint. “This clean sheet approach is why you see this dramatic and environmentally combination of luxury and performance,” said Joe Eberhardt, head of North American operations for Jaguar Land Rover. Price is perhaps the single-biggest challenge for automakers hoping to electrify their product lines, Cogan added. That’s one reason demand has grown slowly – all forms of electrified vehicles commanding barely 4% of the current U.S. new vehicle market. It’s also the reason the sponsors of the award don’t limit their selections to just battery-based products, but also consider models using advanced forms of gas and diesel technology. Among the contenders for the 2018 Green Car of the Year were the Volkswagen Jetta which manages 40 mpg from its gas engine, Also on the finalist list: the new Nissan Maxima which introduces the new VC-Turbo engine. By constantly altering its compression ratio, that breakthrough technology can deliver hybrid-level mileage and V-6 performance, Cogan said. 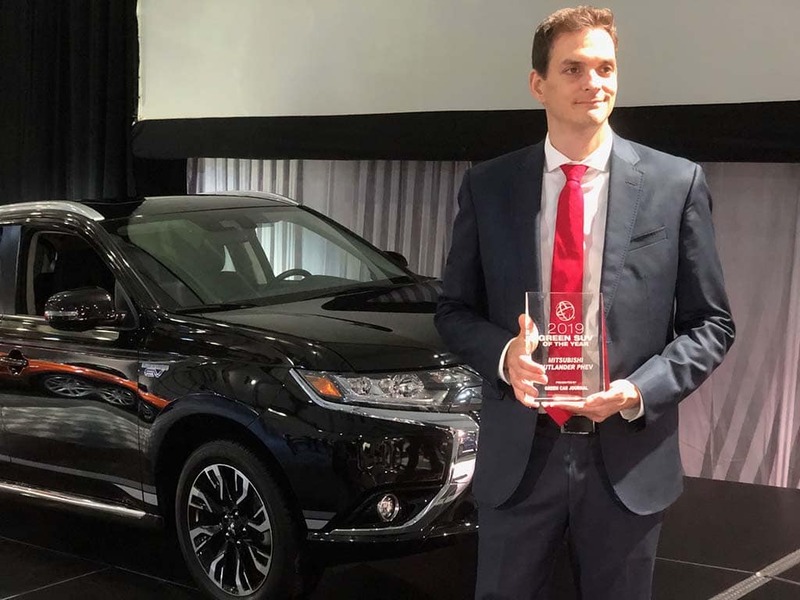 Nate Berg with the Mitsubishi Outlander PHEV and the SUV Green Car of the Year trophy. The winner of the SUV Green Car of the Year manages to operate in a wide range of modes, including both parallel and serial hybrid, plug-in electric, all-electric and all-gas. And Mitsubishi is hoping the Outlander PHEV will help it gain some traction in the U.S. market after years of decline. While sales are still modest, the L.A. Auto Show brings a flood of new green cars to market, ranging from mainstream to luxury. There’s also a big push for environmentally friendly performance with models like the Audi e-tron GT. That battery concept car – set to go into production in 2020 – will get about 250 miles per charge while still launching from 0 to 60 in a mere 3.5 seconds. This entry was posted on Thursday, November 29th, 2018 at and is filed under Auto Shows, Automakers, Automobiles, Business, Crossovers/CUVs, EVs, Electrified Vehicles, Environment, Fuel Cell, Fuel Economy, Honda, Hybrids, Jaguar, Los Angeles, Luxury Vehicles, Markets, Mitsubishi, Nissan, SUVs, Safety, Sales, Technology, Trends, U.S./North America, Volkswagen. You can follow any responses to this entry through the RSS 2.0 feed. Both comments and pings are currently closed.